I recently returned from walking a large portion of the Rota Vicentina Trail in Portugal. I would love to do it again. This was an incredible twelve day hike on the coast (The Fishermans Way) and a little bit inland (The Historical Way). The trails were easy to walk and very well-marked. I may have spent longer staring at and contemplating the ocean than actual walking, but it was time well spent. Heading back to Berlin after two weeks living out of a backpack was good, but I miss the tranquility and flow of walking in sand, listening to the waves crash on shore, and the overwhelming beauty of Portugal. We finished hiking the entire Rheinsteig, from Bonn to Wiesbaden, this past Friday. It was an incredible hike and quite challenging. The weather was mostly accommodating with only a few days of rain; for most downpours we were safely nestled in a hotel or restaurant. The seemingly unending ascents were difficult but manageable, with the steep descents being much more difficult because of the old knees we carry. We walked 320 kilometres and 79 hours. As we walked, I could not help comparing the Rheinsteig to the Camino, of which, we have only covered one week (from Paloma to Burgos). Our companions on the Rheinsteig have walked the Camino many times. Overall, the Rheinsteig has a lot more steep and demanding climbs than the Camino, unless you start the Camino in France where you have a mountain range you must negotiate before you get to rolling hills. 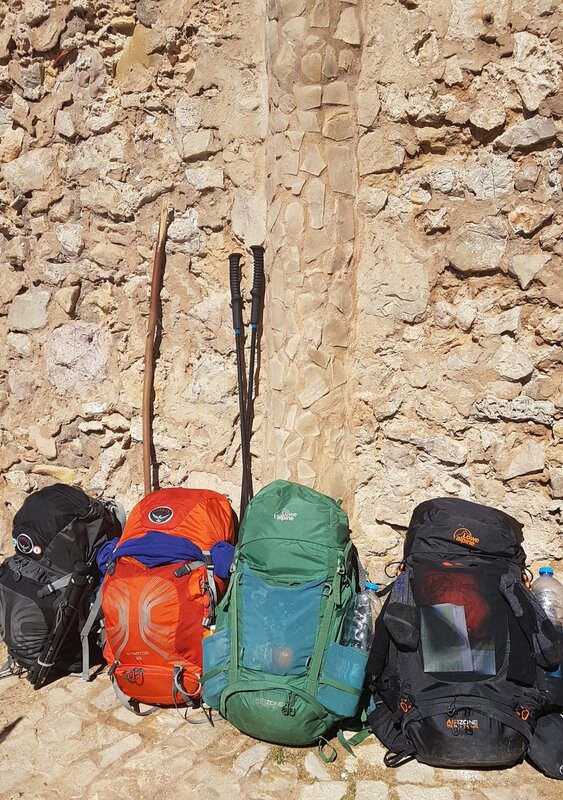 The Camino is better supported for the long-distance hiker, with plenty of water fountains, snack stops along the way, as well as cheap accommodations scattered throughout the trail. The Rheinsteig has no water breaks, spotty refreshments, and expensive and sub-par accommodations. In Germany, there are also closed days for the restaurants, so coming into a town you cannot know what will be open, if anything at all. These Rheinsteig complaints, however, did not reduce the amount of joy and excitement we received from hiking the trail. It is a remarkable trail, with breath-taking vistas, and beautiful landscapes. I would definitely do it again and recommend it to anyone interested in long-distance hiking. The Rheinsteig is scattered with old structures, castles, and other ruins. Tomorrow's hike includes plenty of UNESCO recognized castles and castle ruins and I look forward to seeing them and posting about them. Until then, here are some photos of structures we have seen over the past week and a half. That's us of course, and in the background is Marksburg, above Braubach. Sayn Schloss and fort above. Schloss Arenfels with a modern freeway behind it. 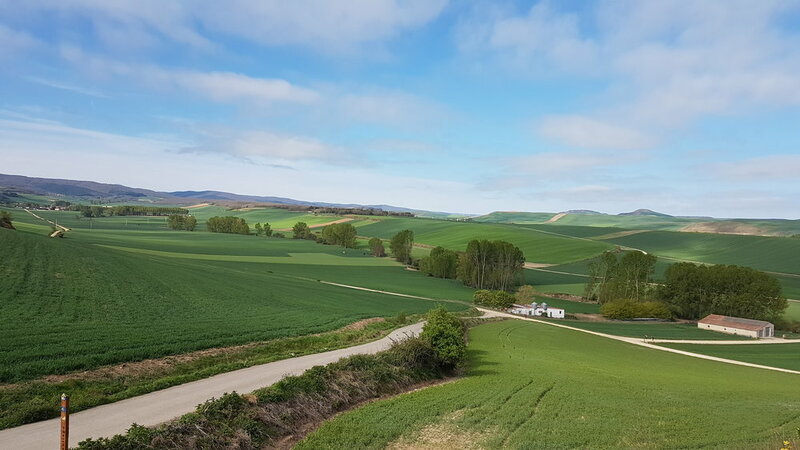 In April, my wife and I joined friends in Pamplona, Spain to walk a section of the Camino de Santiago, from Pamplona to Burgos. We had warm, blue sky days with great walking, food, and drink. We were in Spain over 10 years ago and it was wonderful to return. Our friends carried on to the end but we had to head home after Burgos, where we had a fantastic lunch. Perhaps we will return to finish the walk.